Paralympic athletes Ellen Keane, Noelle Lenihan, Jason Smyth, Nicole Turner and Patrick Monahan pictured with Miriam Malone, CEO of Paralympics Ireland, and Steve Tormey, chief executive of Toyota Ireland. Toyota Ireland has been announced as the official partner to Paralympics Ireland and to the 2020 and 2024 Irish Paralympic teams. The announcement builds on Toyota’s worldwide Olympic and Paralympic partnerships in the mobility category. The campaign, which marks Toyota’s first global ad campaign, centres on the aspiration of movement for all in support of Toyota’s eight-year global commitment to the Olympic and Paralympic Games. The first film in the campaign, which was revealed last week, profiles 100 real-life mobility stories featuring people from every stage of life, across five different countries, including Paralympic and Olympic athletes. 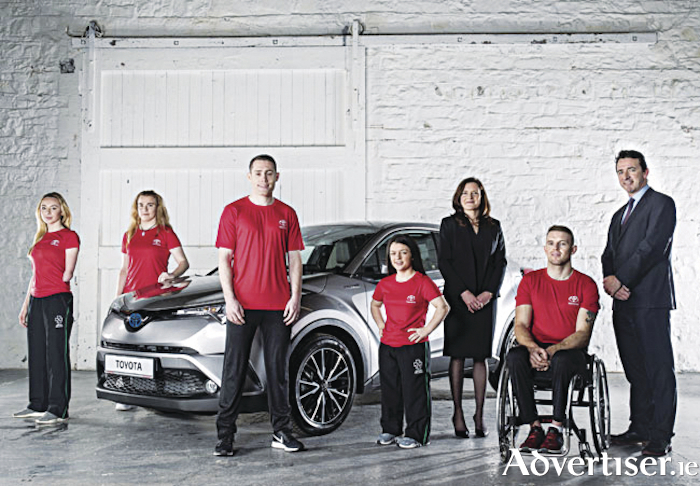 Commenting on the partnership, Steve Tormey, chief executive ofToyota Ireland, said: “We’re delighted to support Paralympics Ireland as they prepare to compete on the global stage in Japan in 2020 and Paris in 2024. "There’s a natural fit between Paralympics Ireland and Toyota Ireland’s brand values of being relentless, inventive and considerate – three traits which closely parallel what Paralympics is all about. We believe we are uniquely positioned to support the organisation and its athletes over the next eight years.